Corporate social responsibility of Bank Pocztowy towards its clients, employees, bondholders and the society is an integral part of its operations. The principle has been confirmed in the new development strategy for the years 2014-2017 entitled “Activation, profitability, education” adopted in June 2014. The mission of Bank Pocztowy is to be a leading supplier of financial services in all regions of Poland, offering “simple and @ccessible banking”. What does it mean? @ccesible: offering financial services at affordable prices in the largest access network, through Poczta Polska outlets, Bank’s outlets and remote channels. Clients have always been the focus of our attention. The Bank wants to know its clients, understand their needs and respond to them through innovative solutions. Clients from the Traditional and Senior segments most often use the services offered by Bank Pocztowy compared to the entire market. Knowing its clients, the Bank prepares an offer tailored to their needs, with special focus placed on its transparency and simplicity. In 2014, it offered its clients with Konto ZawszeDarmowe, the first account in Poland with indefinite zero charge for maintenance guaranteed. Along with this product, loyalty programs have been introduced, to include Pocztowy Pakiet Ubezpieczeniowy (Postal Insurance Package). Holders of Pocztowe Konto Nestor were included in the loyalty programs in 2014: when paying card in pharmacies, they will be refunded 5% of the purchase value. We respect our clients’ habits. Therefore, our services are available to clients countrywide, regardless of the size of their town or village. At the same time, we educate our clients and encourage them to use handy e-distribution channels. In order to ensure high service quality, we have adopted client service standards depicting desirable behavior to be adopted by advisors when discussing with clients. The description includes discussing with clients coming to the outlets, telephone calls and e-mail correspondence. The aspects described in the book of standards are monitored in the form of Mystery Shopping and Mystery Calling. Further, the Bank has carried out Net Promotore Score (NPS) survey assessing whether consumers are likely to recommend services of a given company. The survey has been carried out on a quarterly basis. Also, a blog has been maintained on the Bank’s website as an element of dialog with clients. A number of messages published in the blog, such as introducing Pocztowy24, the new Internet banking system, have met a strong response on the clients’ side. Ensuring work-life balance, among others through supporting employees’ passions and hobbies. Various aspects of remuneration policy, competency building, developing growth and promotion paths are presented in Section 10 “Human resources management”. Bank Pocztowy supports non-professional interests of its employees, to include sports. Most sports events are organized in cooperation with Poczta Polska based on an arrangement on cooperation on sports and tourist activities of September 2013. The total of 140 employees of Bank Pocztowy participated in these events. Providing employees assistance in the form of reimbursable housing loans. Bank Pocztowy assists its clients in financial transactions and participates in initiatives preventing social exclusion. As in previous years, in 2014 we supported the research of banking and financial exclusion in Poland faced by demographical structure changes. The Bank was a Professional Partner in the First Silver Economy Conference. It gathered nearly 200 participants countrywide, to include representatives of government agencies and NGO and people related to Third Age Universities. Financial education was discussed also at University of Saving. As in previous years, the Bank supported the series of radio programs. These four large publications provided readers with useful information about practices favored by elderly clients: their likes and dislikes and expectations regarding the use of financial services. Apart from informing, they were to eliminate stereotypes and show that informed use of banking services can soon substantially simplify daily routines. Results of surveys commissioned by the Bank were used when preparing these publications. “Przekaz ku przyszłości”, an educational scholarship program by Pocztowy Dar Foundation intended to support talented and ambitious students of all types of schools who want to develop their interests and talents. It is to cover costs of additional courses (including language courses) and purchase of items necessary to support educational goals (e.g. software, instrumentation, sports accessories etc.). It is addressed to students who obtain very good marks and have additional credits in science, culture, sports or social initiatives. In 2014 it included 81 students of primary schools, gymnasiums and lyceums. Scholarship program for Poles studying in Poland and abroad by IVY Poland Foundation, aimed at supporting the most talented Poles who want to study at the best Polish and foreign universities, which should enhance the international image of Poland and integrate universities. Initiatives of Robinson Crusoe Foundation, to include the following projects: Kontrakt Robinsona, Zimowe Warsztaty usamodzielnienia Robinsona included in Wehikuł usamodzielnienia program aimed at supporting people in charge of the Foundation in achieving independence. In December 2014, the Bank became a partner in Zostań Aniołem (Become an Angel) initiative, when funds were collected to support educational and development programs for young people included in various forms of foster care to help them become independent. How to become an angel? Bank Pocztowy supported business development initiatives, among others a business debate entitled “Strategy change: is it always feasible? Objectives, costs and benefits in short- and long-term perspective” organized by ICAN, the published of Harvard Business Review Poland. The Bank was a partner in the debate. Aware of the growing importance of e-commerce in Poland, appreciating the popularity of this sales channel, Bank Pocztowy has decided to become a Partner of the 4th European Finance Congress, organized by Gdańsk Banking University. The Bank initiated a discussion panel called E-commerce: a new business model. At the same time, in cooperation with Bonnier Business Polska, the published of Puls Biznesu daily, in 2014 it implemented a pioneer initiative called Business e-Gazelles, i.e. the Business Gazelles for e-business. As a result, a ranking of the fastest-growing small and medium e-commerce firms in Poland was prepared. It included firms that saw rapid growth over last three years, i.e. 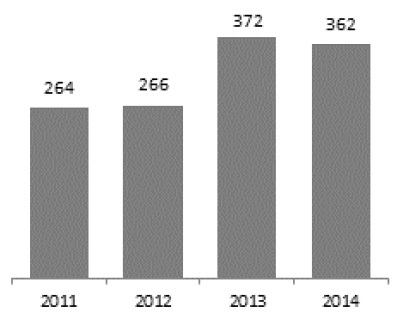 generated profit in 2013 and the largest y-o-y revenue increase in the period 2012-2013 expressed in percent. Almost 300 firms from around the country were granted the e-Gazelle title. Additionally, 16 top e-Gazelles (one best from each province) were awarded. During the five final galas organized in Poznań, Sopot, Katowice, Kraków and Warsaw, the winners were granted statuettes and could share their experience in this type of business activity. Each gala was accompanied with a panel discussion attended among others by representatives of the Bank’s Management Board and selected ranking winners. The discussion was to see the e-commerce related issues both from the viewpoint of market players and suppliers of financial and logistic services that significantly impact the form and quality of e-commerce in Poland. Puls Biznesu published reports from all galas and presented the most interesting e-businesses. Information regarding the ranking and later reports are available at a dedicated website egazele.pb.pl. In 2014 the Bank continued promoting of active lifestyle and sports, both for amateurs and professionals. As in previous years, it provided financial support to Unibax Toruń and Stal Gorzów Wielkopolski, speedway motorcycle racing clubs. It was a sponsor of World Speedway Motorcycle Racing Cup held in Bydgoszcz in August. At the same time, it supported Polish Horseback Riding Association. As an official partner of Horseback Riding Celebration of the Independence Day 2014 it promoted initiatives memorizing the 4th of June as the Independence Day and 25th anniversary of the first free elections. The campaign included lectures for children and youth on interesting fragments of Polish history, also related to horseback riding and learn the benefits of this hobby in their future life, including training of useful treats, such as responsibility, reliability and diligence. Since Bank Pocztowy has addressed its offer to citizens of small towns and villages, it focuses on local initiatives supporting financial education, education of children and youth and business development. Further, it provides financial support to those in need. Bank Pocztowy has a Donation Committee, which, according to the By-laws, may distribute up to 1.5% of gross profit generated in the previous financial year. In 2014 Bank Pocztowy S.A. granted support in excess of PLN 362 thousand.